AYJET has signed a purchase agreement for 6 Sonaca 200 aircraft. Sonaca Aircraft is flying across Europe ! 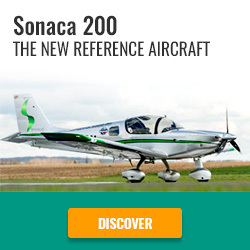 Do you wish to discover and fly the Sonaca 200 ? Unforgettable experiences in the air: Belle-Île-en-Mer, Brittany, France. Thanks to FLYER magazine (UK) for this beautiful air-to-air shot of the Sonaca 200. Belgian Air Force Days 2018: Ready For The Future! Sonaca 200 Type Certified ! This short video of the last spin tests concludes the flight test campaign. Sonaca Aircraft has been given EASA CS-VLA certification for the Sonaca 200.